It’s really good — and you can make it even better. 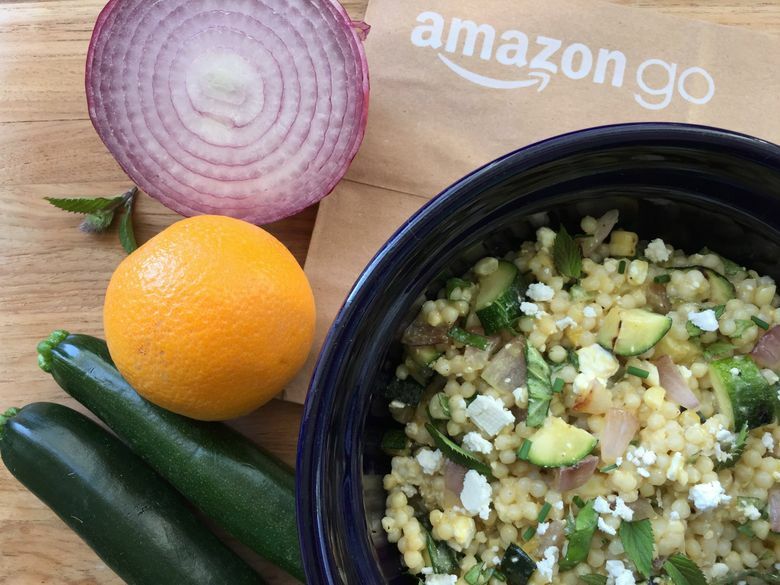 Whatever you think of Amazon Go — the grab-and-go market where Big Brother is your cashier (one open now, another on the way) — they know how to make a great couscous salad. Or, rather, they know how to make you make a great couscous salad. 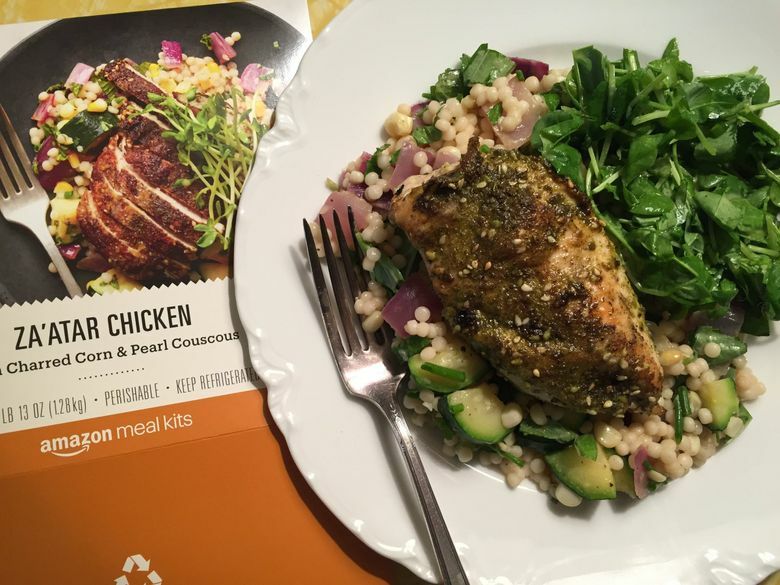 When I tested various meal kits a few months ago, the Charred Corn & Pearl Couscous in Amazon Go’s kit was the one thing that made me think to myself, “I really want to make that again.” The Za’atar Chicken it came with was just all right, but the couscous salad was citrusy from an orange-honey-mustard dressing, bright with fresh herbs, and full of still-slightly-crunchy vegetables. Out of all the dishes in all the kits, it was the only thing that got eaten up immediately. For what it’s worth, the Amazon Go recipe card offered this “HINT”: “To dice a vegetable means to chop it into cubes.” This insult to all of our intelligence seems, in context, directed at millennials, who may not know certain things but are not devoid of intuition (or, you know, are at least capable of yelling, “ALEXA WHAT DOES DICE MEAN IN COOKING?!”). 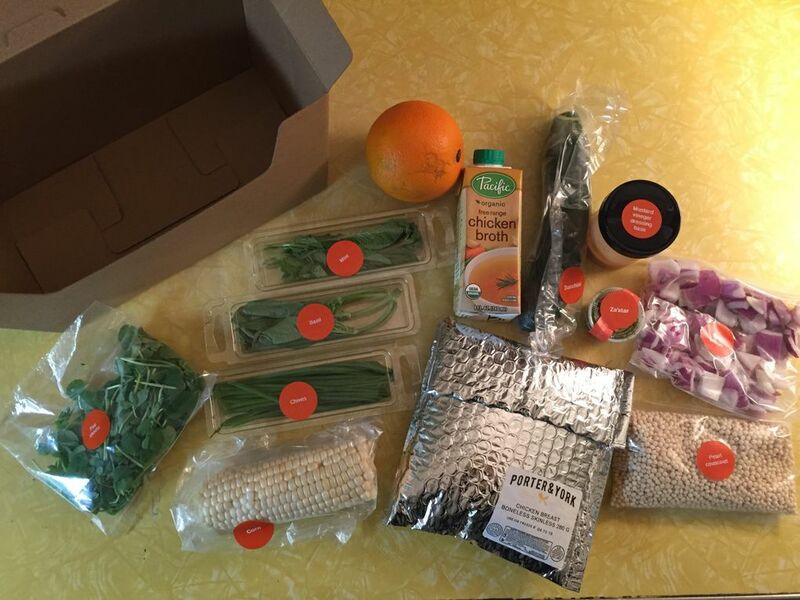 And while you won’t be contributing a bunch of meal-kit-packaging plastic to the Great Pacific Garbage Patch, there will be some actual food left over. In case you need some Amazon-style lowest-common-denominator hand-holding, here are some things you can do with it. Red onion: Slice, grill and put on a hamburger. Or put in another salad, grilled or raw, diced (now that we know what “dice” means). Honey, mustard: Make more orange-honey-mustard salad dressing and put it on salad. Put mustard on a hamburger. Put honey in yogurt, a smoothie, or tea, or save for fall and make hot toddies (Google “hot toddy recipe”). Eat honey with spoon. Mint, basil: Chop and put in another salad. Put in a smoothie (no joke, it’s really good!). Feta: Crumbled feta on top is the thing that makes avocado toast truly worth not being able to own a home for. If you don’t have a grill, you can make step one a quick sauté in a large skillet over medium-high heat instead; follow the same directions (but don’t heat the pan until your vegetables are all prepped … ALEXA WHAT IS SAUTÉ?!). Serve with grilled fish or meat, or hamburgers, or lamburgers, or as a hot-day lunch or dinner on its own. Double the recipe and take to a barbecue to impress your friends! You made it yourself! Not to blow your mind, but you could throw other vegetables in, too, like halved cherry tomatoes. 1. GRILL THE VEGETABLES: Heat the grill to medium-high. Cut the zucchini in half lengthwise. Cut the red onion in half, slice off one round (about ½ inch thick), and remove its outer peel. Husk the corn. Put all the veg (use the slice of onion, not the rest) on a large plate or pan, add a teaspoon of olive oil, and shake/move around/use your fingers to lightly coat; sprinkle with a little kosher salt and fresh-ground pepper. Put vegetables on hot grill and cover. After 5 minutes, turn them, then grill another 2 to 3 minutes. Take off zucchini and onion; turn corn and grill it another 2 to 3 minutes. Take corn off grill and let all the veg cool. 2. MAKE THE COUSCOUS: Bring the broth to a boil in a medium saucepan. Add the couscous; return to a boil, then reduce heat, cover and simmer until the broth is absorbed, about 20 minutes. Fluff with a fork and set aside to cool. 3. MAKE THE DRESSING: Cut orange in half and squeeze juice into bottom of large bowl; remove any seeds. Add olive oil, mustard, honey, salt and maybe 10 grinds of pepper; combine thoroughly with whisk or fork. 4. CUT UP THE VEGETABLES: Slice/dice the zucchini into small-bite-sized pieces. Dice the red onion into about ½-inch pieces. Carefully cut the corn kernels off the cob with a knife (breaking it in half first helps). 5. MIX IT ALL TOGETHER: Stir the dressing again to recombine. Add the couscous, the vegetables, the feta and the chopped herbs. Mix gently to combine. If you can let it sit, refrigerated, for a few hours or overnight, it’ll taste even better, but if not, no big deal. Serve at room temperature or chilled.